Terrific Tuesdays Roundup . . . Stampin' Up! Black Friday, and more! I simply cannot believe it is Thanksgiving week!! Wow! How about you? That means Christmas is right around the corner. What is everyone planning for the holiday this week? Family gatherings? Are you cooking, or being the guest?! 😉 LOL I am doing a little bit of both! We haven't chatted in a little while about all the goings on at Stampin' Up!, so let's play a little catch up this week and review, because exciting things are coming later in the week . . .
Catch a Whole Flurry of Snowflakes!! Are you missing out on the November Exclusive - Snowflake Showcase!! Extremely popular - and we will be focusing on this beautiful set over the next several days!! But it is ONLY available during November (while supplies last) - and the White Velvet Paper is already sold out!! There is so much to love about this set of products!! See all the details by clicking on the image above or HERE. Get Ready!! Something Wonderful Your Way Comes!! On December 5th you will get a chance to order this wonderful craft carry bag made specifically for your Stamparatus - and it has pockets for so much more!! Then get ready to order Your Very Own - On December 5th!! We’re throwing a spectacular six-day promotion with exclusive, limited-time deals. Get ready for the Annual Online Extravaganza! Start Working on Your Stampin' Up! Orders ~~ And Get Ready to Shop!!! It Kicks off HERE 0n Black Friday Morning!! 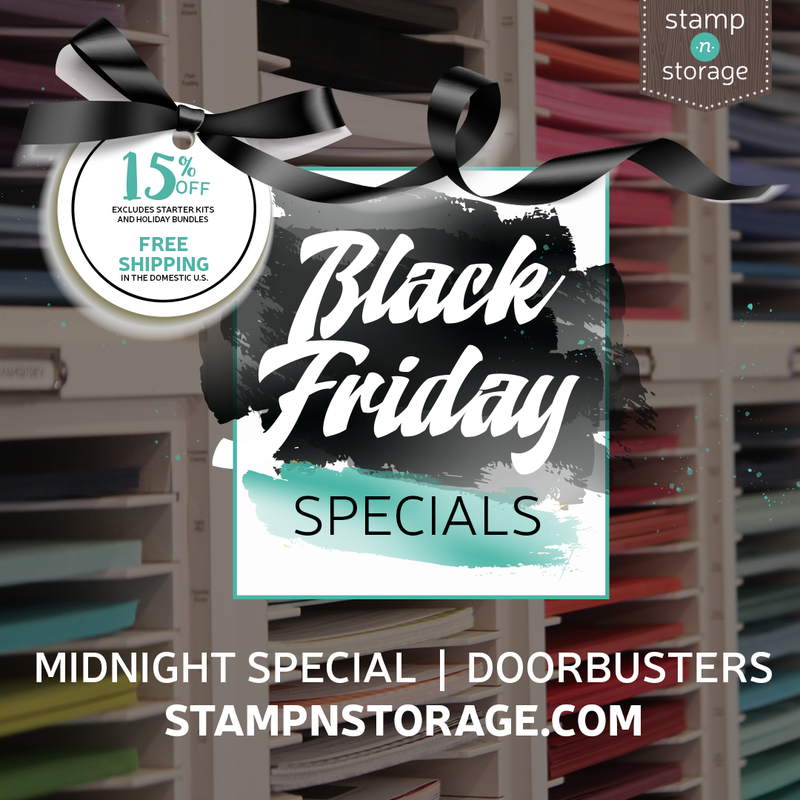 STAMP-N-STORAGE HOLIDAY SPECIALS START TODAY! If you LOVE organized space with quality products you’ll use for years to come, Stamp-n-Storage is the place to shop. Starting this past Monday, they are offering 15% OFF almost everything AND FREE SHIPPING on all domestic U.S. orders.. This sale excludes Starter Kits and Holiday Bundles. This sale will be through Cyber Monday, Nov. 26 with additional sales popping up in between. PLEASE NOTE: I receive a small affiliate fee when you use my Stamp-n-Storage shopping links. However, I can’t say enough about how these quality products help me stay organized and highly recommend them. I designed my entire Studio around Stamp-n-Storage!! They are the Number One Pick for stamping organization!! Start Shopping NOW - HERE!! That's all for now!! We'll be back in awhile!! Get those shopping lists ready!! !